one // This is one of the newest beauty products I have bought and L-O-V-E-D. Charlotte Tilbury is one of my favorite makeup brands (I also use this and this daily) so when a lot of my trusted blogger friends started using Flawless Filter, I knew I had to try it. The product has become a fast favorite for me. I use it as an all-over highlighter and this summer it is has replaced my BB cream all together. I love the shine and smooth finish it creates on my skin, and it also acts as the perfect primer for this product. I’m currently on my second bottle and there is no looking back! Shop the multipurpose highlighter here. two // Over the past few months, I have been seeing quite a few how-to articles on dry brushing, but to be honest, they never really grabbed my interest. Then Goop sent me this amazing dry brush and I felt like I no longer had an excuse not to give it a try. I have to admit, I have noticed a big change in my skin – so much less dry, and so much more smooth. I have added it to my morning routine, and find it to be an oddly refreshing way to wake up. You can find the Goop brush for just $20 here. three // Drying and styling my hair is at the top of my annoying task list (if you haven’t noticed I haven’t been curling my hair much lately, and instead opting for a low sleek bun, which saves me so much time). Despite having fine, thinner hair, it feels like it can take a lifetime to dry. Earlier this spring, based on a recommendation from a girlfriend, I bought one of these ultra-lightweight hair towels. It has quickly become one of my favorite beauty items! It is simple, but I find this towel an easier and faster way to towel dry my hair. Sometimes it is the little things that count! Find your own here. four // Never in a million years did I think I would be that person with an expensive hairbrush – but here we are. I was looking for a brush that would help me style my hair in a low sleek bun and this brush popped up a number of places as very highly recommended. Since using it I have noticed overall shinier hair – with a lot less breakage. While a great overall brush, the #1 reason I would recommend it is for the boar bristles. They are able to smooth the hair in a way most other brushes can’t, allowing you to create that slicked look when styling for a sleek ponytail. The air vents in the back allow for quick drying as well. You can pick up this boar bristle brush here! five // I don’t wear a ton of makeup – or at least I don’t think I do – so a makeup setting spray was never really a huge priority for me. However, over at a friend’s house I ended up using Urban Decay’s All Nighter and loved how it held my make up in place and how it helped to finish/set my makeup. I thought about buying it and was even more convinced by seeing the number of over-the-top positive reviews and loves on both Nordstrom and Sephora (yes I am that person that reads all of the reviews). It has been an awesome addition to my beauty cabinet. Shop for this setting spray here. You can also check out a few of my other favorite beauty products in recent beauty posts here and here! 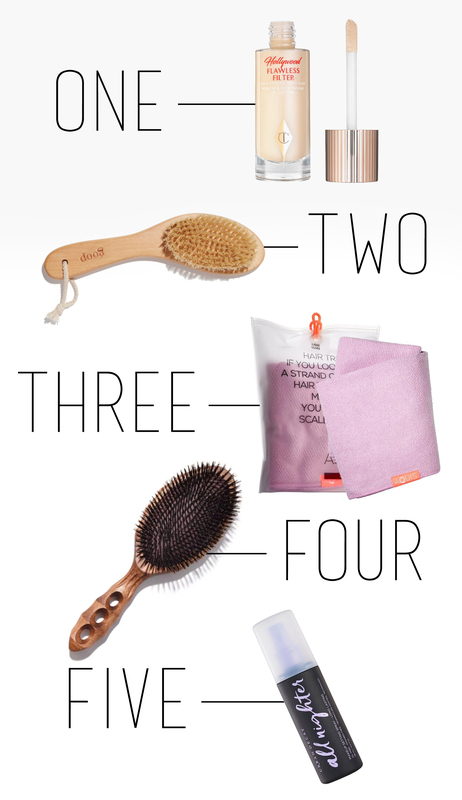 The post FIVE BEAUTY PRODUCTS I DIDN’T KNOW I NEEDED appeared first on Atlantic-Pacific.